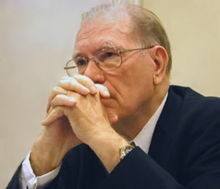 Lyndon LaRouche, American political figure and economist who was sentenced to 15 years’ jail for fraud has fallen hook, line and sinker for an April 1st joke on a Second Life blog. No, Rupert Murdoch did NOT pay $30 million for a Second Life blog that posted three articles in six months. This sentence on the blog should have been a clue: “Simon Lameth, owner of Metaverse Media before the purchase, was seen running from the press conference to the Ferarri dealership down the street”. Especially since Simon Lameth wrote the post. Besides, would you believe a guy that can’t spell “Ferrari”? I’ve decided I’m not subscribing to Mr LaRouche’s Executive Intelligence Review.